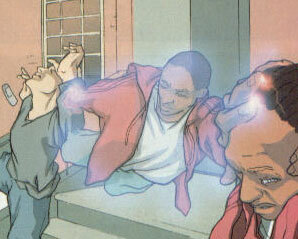 Powers/Abilities: Bobby Soul was a mutant who could take possession of another's body. While inside their body, he had access to all of their thoughts and memories. Usually after he possessed someone, he would suffer from temporary memory loss, often having trouble even remembering who he was. History: (NYX: No Way Home I#3 (fb) – BTS) – As a child, Bobby and his older sister Mali took care of each other since their mother had numerous problems, including men she “had to answer to.” Surviving for years, Bobby was shocked when the 16-year old Mali was kidnapped on her way home from school. When she turned up days later, naked and dead in a dumpster, Bobby blamed himself. Deducing that Mali had probably been killed by one of his mother’s connections who wanted Mali for his own, Bobby began to feel as if he were contaminated by the terrible world around him. Nearly leaving home after the death of Mali, Bobby decided to stay around to take care of his L’il Bro, who was all smiles until the day his mother left him alone with one of her connections for an afternoon. Coming home to find L’il Bro and his mother’s associate together, Bobby’s mutant power first manifested and he possessed the man with “permanent consequences.” He afterwards tried to forget what he had seen and done. (NYX I#6 (fb) – BTS/NYX: No Way Home I#1 (fb) – BTS) – At some point, Bobby began using his powers as hired muscle for various mobsters, including the pimp Zebra Daddy. (NYX: No Way Home I#2 (fb) – BTS) – Bobby got to know a gangster by the name of D’sean and his daughter, Keisha. 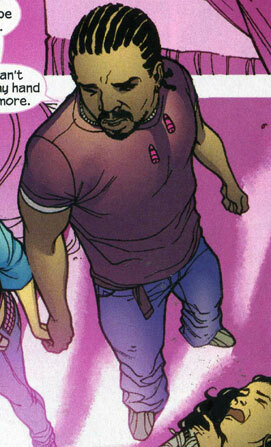 (NYX I#6) - While possessing the body of celebrity L-Ro, Bobby, now calling himself Felon, got a call on his cellphone from the pimp Zebra Daddy. He returned to his body to answer the phone and Zebra Daddy explained that he needed to talk. Suffering from temporary memory loss due to the possession, Felon had to remind himself that his real name was Bobby Soul and agreed to meet with Zebra Daddy. Later in the Flatiron District, Zebra Daddy explained to Felon that one of his girls had come up missing and that he wanted Bobby to bring her back. At first Bobby declined, but Zebra Daddy offered to give him $5,000 towards getting him and his little brother out of their rut. Eventually Zebra Daddy gave Bobby half of the money up front and suggested that he speak with another of his girls named Tanya. Felon finally agreed and then returned to his home in District X. Once there, he woke up his autistic younger brother and made breakfast for him. When Bobby mentioned that their ship had finally come in, his brother telepathically asked if he was going to be using his powers. Bobby explained that it was a job for Zebra Daddy, but that he wouldn't have to do anything bad this time. Soon after, Mrs. Alba arrived to watch over his brother and Bobby left to go find Tanya. Tanya told Felon that she had already told Zebra Daddy all she knew and gave Felon the address of Cameron Palmer, whom she had seen in the company of Zebra Daddy's girl. Felon then went to the apartment listed on the address and found the landlady, who asked if Bobby was one of Ms. Palmer's students. Realizing that Cameron was a teacher, Bobby then visited Rudolph Giuliani High School, where he spoke with Tamisha and a few of her friends about Ms. Palmer. The girls explained how Hector had shot Ms. Palmer months ago and stared down a girl named Kara as she walked past. Felon quickly asked why they were staring and then explained that Ms. Palmer had hung out with Kara. When Kara refused to give Felon any information, he possessed her body and told her that if she didn't tell him what he wanted to know, he would force her to walk over and slap Tamisha's face, and then leave her to deal with the repercussions. Kara soon agreed and Felon got the information he needed. Afterwards, Felon visited the home of Kiden Nixon, where he possessed her brother, Tyler, and called Zebra Daddy to tell him that his girl was hanging out with two others: Kiden Nixon of Alphabet City and Cameron Palmer, a teacher. He told Zebra Daddy that the girls would not be returning to Kiden's home after learning information from Tyler's mind. He then hung up and reentered his own body. Grabbing his cellphone from Tyler, Bobby punched him, explaining that it was being a crappy brother. That night when Bobby returned home, he fed his little brother, explained that he did have to use his mutant powers, and then apologized. He also explained to his little brother that due to the memory loss caused by his powers, he could not remember how he got two bus passes to Las Vegas or how he received that $2,500 in his pocket. Terrified at what he could have done, Bobby asked his brother if he had hurt someone. In response to Bobby's question, his brother projected a mental image of deceased policeman, Nick Nixon. (NYX I#7) - The mental image soon took on a life of its own and began to speak to Felon, explaining that yes, Felon had done some bad things and that four young ladies were in great danger because of him. Felon claimed that he couldn't do anything about it now, but the image told him that he could help and pointed at Cameron Palmer's address on the table. When Felon told Nick that he couldn't leave his brother home alone, Nick replied that it was a chance he was going to have to take. The image then asked what his brother thought of Bobby leaving to help the girls and his brother winked to signify that Bobby should help. After the image of Nick disappeared, Bobby quickly told his brother that he had to go. Felon soon arrived outside the apartment of Cameron Palmer, who was being attacked. When Kiden Nixon decided to help, she saw a vision of her father, Nick, who explained that the girls needed to get to safety and that Felon was there to help. Zebra Daddy soon confronted the girls and when Felon reminded him that he said no one would get hurt, Daddy ordered one of his men to point a gun at Felon as well. X-23 (Zebra Daddy's "girl") responded by cutting off Zebra Daddy's hand and decapitated Diesel, one of the gunmen. A fight soon broke out, with Felon possessing one of the gunmen and then causing the man to shoot his own leg. He then returned to his own body and began suffering from memory loss. By the time he had regained his memory, the battle was over and Zebra Daddy was dead, thanks to X-23. He then led the girls back to his apartment in District X and to safety. (NYX: No Way Home I#1) – Allowing the girls to live in his apartment, Bobby was feeding L’il Bro when Kiden and Tatiana came back from a dumpster diving excursion. Cameron Palmer soon came to visit them, bringing groceries & reminding them all that they should be in school. Bobby replied that he did not have time for school, as he had to make a living. Hours later, Bobby, Tatiana & L’il Bro met Kiden as she was getting off work to inform her that his landlord had raised their rent again. The group discussed what they were going to do about rent as they went to visit Cameron Palmer at her apartment for dinner. When they opened the door, they found Ms. Palmer’s apartment ransacked and Cameron missing. (NYX: No Way Home I#2) – In Cameron Palmer’s apartment, Bobby noticed a hat that he remembered belonging to an old associate of his, D’sean, while Kiden and Tatiana searched the apartment for clues. Quickly leaving the apartment before the police arrived, they all returned to Bobby’s apartment, only to find it also crawling with police. Bobby began arguing with Kiden, who immediately wanted to rescue Cameron Palmer, claiming that they needed to take care of themselves. An hour later, Bobby accompanied the girls to a nearby diner where they continued to argue. When Tatiana sided with Kiden, Bobby revealed that he had found the hat. Hoping to find more clues, Bobby and the girls visited D’sean apartment, where a gunman shot Tatiana. (NYX: No Way Home I#3) – Hearing the shot, Bobby rushed into the room and viciously beat the gunman until Kiden reminded Bobby that they needed the man alive. Realizing that he had almost killed the man, Bobby grabbed up L’il Bro and held him close as he thought about the first time his powers had manifested. He soon took off his jacket to wrap around Tatiana when D’sean arrived with a group of gang members. They quickly pulled their guns on Bobby and the girls but Kiden used her powers to pull Bobby and her friends outside of time, allowing them to escape. Taking Tatiana to a hospital, Bobby, Kiden and L’il Bro quickly left when they saw themselves on television as wanted for questioning in Cameron Palmer’s kidnapping. Hiding out at Empire State University, Bobby and Kiden discussed what their next step was, unaware they were being watched by the enigmatic Tattoo Man. The Tattoo Man soon made himself known when he confronted Bobby and Kiden. Claiming that it was his job to push and groom others into their own survival, Tattoo Man knocked Kiden out with his knife, prompting Bobby to possess the Tattoo Man, forcing the Man to stab himself with his own knife. Waking to see L’il Bro and Kiden, Bobby had no idea who they were due to the temporary amnesia caused by the use of his powers. (NYX: No Way Home I#4) – Thinking Kiden was crazy when she tried to explain who he was, Bobby’s memories soon began returning to him when Kiden reminded him to take care of L’il Bro. As his memories slowly returned, Bobby, L’il Bro and Kiden used Kiden’s powers to return to the hospital to retrieve Tatiana. When Kiden’s powers began acting up in the hospital, Bobby and the others briefly appeared in front of the SHIELD Cape Killers who were guarding Tatiana. Using her powers immediately again, Kiden accidentally brought a SHIELD agent into her no-time zone. Bobby headbutted the agent, causing time to come speeding back with the power of Bobby’s headbutt, knocking the SHIELD agent through the wall. Retrieving Tatiana and escaping using Kiden’s powers, Bobby mentioned that he knew a doctor that could help them and after a brief argument, the group decided to visit the apartment of Dr. Cecilia Reyes, who removed Tatiana’s bullet and stabilized her. (NYX: No Way Home I#5) – Bobby was awakened by the injured Kiden Nixon, who had returned from a brief confrontation with the enigmatic Sniper Chick. Despite his best efforts to learn who had hurt Kiden, Bobby was met with arguments by Kiden and a demand that they leave. Hiding out in the subway, Bobby checked on Tatiana and argued with Kiden, claiming that he could not keep living on the streets. Eventually, Kiden left Bobby and Tatiana behind, deciding that she did not want to see them hurt as she seemingly disappeared from their view using her powers. When L’il Bro subsequently projected images of Kiden being tortured by the Sniper Chick, Bobby and Tatiana decided to find her. Tracking Kiden to the headquarters of the Sniper Chick, Bobby was captured and prepared for torture along with Tatiana. (NYX: No Way Home I#6) – Hallucinating due to the Sniper Chick’s drugs, Bobby was eventually rescued by Tatiana, who had assumed the form of the Sniper Chick due to contact with the Sniper Chick’s blood. After L’il Bro killed the Sniper Chick with a psychic projection of a dragon, Bobby and Tatiana rescued Kiden and the group then rescued Cameron Palmer. Leaving Palmer at Memorial Hospital, the group left to continue surviving. (X-23 II#1) – Bobby, Tatiana, Kiden and L’il Bro sat on a rooftop around a fire arguing about their lack of a proper home when L’il Bro projected a trail of psychic creatures. Freezing time to investigate, Kiden followed the projections to X-23, who was under psychic attack by the Gamesmaster. Bringing her back to Bobby and Tatiana, Kiden attempted to learn where X-23 had been while Bobby cared for L’il Bro.When X-23 warned them to stay away, Bobby suggested letting her go but Kiden followed. Following Kiden, Bobby and Tatiana met Wolverine, who had tracked X-23 there. As X-23 returned to Wolverine, Kiden told her that if she ever needed to run, she could run to them. (Heroic Age: X-Men I#1 – Bobby Soul entry - BTS) – Captain America wrote a dossier on Bobby Soul as one of many mutants he was researching upon taking up the position of SHIELD director. Concerned at Bobby’s past with Zebra Daddy, Captain America considered contacting Bobby before Bobby made any other bad choices. Comments: Created by Joe Quesada, Robert Teranishi, and Chris Sotomayor. Bobby's Lil' Bro was never actually named in the course of the stories. L-Ro is an obvious parody of singer/actress Jennifer Lopez (J-Lo). Mrs. Alba was the babysitter of Bobby Soul's little brother whenever he had to leave the apartment. The day that Bobby was contracted by Zebra Daddy to find out the location of X-23, Mrs. Alba watched over his brother. D’sean was an old associate of Bobby’s and father to Keisha. When Bobby noticed a hat that belonged to D’sean in Cameron Palmer’s apartment, he informed Kiden and Tatiana. They soon after visited D’sean apartment to look for clues to Palmer’s kidnapping. When D’sean returned home to find Bobby and a gunshot-wounded Tatiana, D’sean pulled a gun on them but Kiden used her powers to pull herself, Tatiana, Bobby and L’il Bro into her no-time zone, allowing them to escape. Keisha was the daughter of D'Sean. When Bobby visited D'Sean's apartment looking for information on the disappearance of Cameron Palmer, Keisha showed up at the door with a black eye. Lil' Bro was the autistic younger brother of Bobby Soul. He was also a mutant who could communicate with Bobby despite his autism using telepathy and could project mental images. Bobby Soul made a promise to him that he would get enough money to move them both out of District X and to Las Vegas so that Bobby could get a job at a casino and Lil' Bro could go to an autism clinic there. In order to gain revenge on his killer and help his daughter, the spirit of Nick Nixon contacted Lil' Bro and appeared to Felon thanks to a mental projection by Lil' Bro. Nick convinced Felon to help get his daughter to safety after Zebra Daddy was killed. Lil' Bro agreed with Nick, winking to signify that Bobby should help. While Felon helped battle Zebra Daddy and his men, Lil' Bro watched via mental projections of the battle on his kitchen table. Following the death of Zebra Daddy, L’il Bro returned to his apartment home with Bobby, Kiden Nixon and Tatiana Caban. Bobby continued to have trouble getting L’il Bro to eat and he later accompanied his friends when they went to visit Cameron Palmer, only to find her apartment ransacked and Palmer kidnapped. Escaping with Bobby, L’il Bro was brought with Bobby when he and the girls visited Bobby’s old friend D’sean looking for clues to Palmer’s kidnapping. Inside, Tatiana was attacked by a gunman. Smiling, L’il Bro projected a mental image of a giant worm-like creature, distracting the gunman enough for Tatiana to escape his grasp. When the gunman shot Tatiana, D’sean returned home to find L’il Bro and his friends. Using her powers, Kiden provided a means of escape and they quickly got Tatiana to a hospital. With Tatiana in the hospital, L’il Bro accompanied Bobby and Kiden to Empire State University, where they met with the enigmatic Tattoo Man, who seemed unimpressed by L’il Bro’s mental projection of a dragon and a robot. After Bobby possessed the Tattoo Man and forced him to kill himself with his own knife, L’il Bro was beneficial in restoring Bobby’s temporarily lost memories. L’il Bro was soon after brought to the hospital to retrieve Tatiana and later joined Bobby and the others at the apartment of Dr. Cecilia Reyes, who stabilized Tatiana. Following an encounter with the mysterious Sniper Chick, Kiden returned to L’il Bro, Bobby and Tatiana, demanding they leave Dr. Reyes’ apartment and once they arrived in the subway tunnels, Bobby argued that he could not keep living on the streets. Feeling that she was only hurting her friends, Kiden left them behind but L’il Bro shortly after projected an image of Kiden being tortured, prompting Bobby and Tatiana to find Kiden. They were all soon captured by the Sniper Chick, who kept L’il Bro with her while torturing Tatiana. After Tatiana rescued Bobby from torture, L’il Bro psychically projected a dragon that killed the Sniper Chick. Together again, L’il Bro and his friends rescued Cameron Palmer, leaving her at Memorial Hospital, and left to continue their lives. He later was with Bobby and his friends when he sensed the nearby X-23. Projecting a trail of psychic creatures that led to X-23, L’il Bro was present when Kiden brought X-23 back for a visit. Lil' Bro, despite being autistic, could communicate telepathically with others and could project mental images, such as ghostly visions of the deceased or groups of people. It might also be suggested that he had some form of astral projection because he was able to monitor Bobby's battle with Zebra Daddy despite not actually being physically present there. L-Ro was a celebrity who was bombarded by the paparazzi. While experimenting with his mutant abilities, Felon possessed L-Ro until he received a phone call from Zebra Daddy. Felon then returned to his own body and left the unconscious L-Ro on the floor.